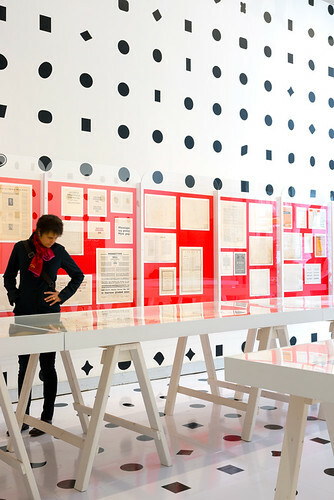 The ‘Century: 100 Years of Type in Design’ exhibition opens today at the AIGA National Design Center in New York. 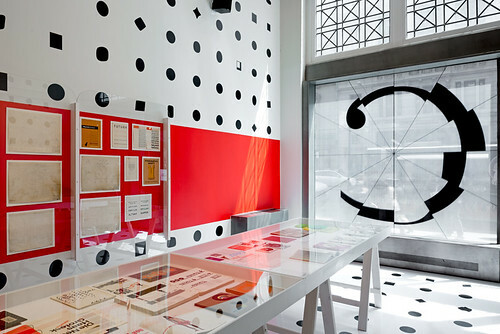 Designed by Abbott Miller (Pentagram) and organised by Monotype, the exhibition shows rare displays and archives, typeface production drawings, and original artwork – drawings, proofs and type posters as well as pieces of advertising, ephemera and packaging. Abbott Miller’s identity for ‘Century: 100 Years of Type in Design’. 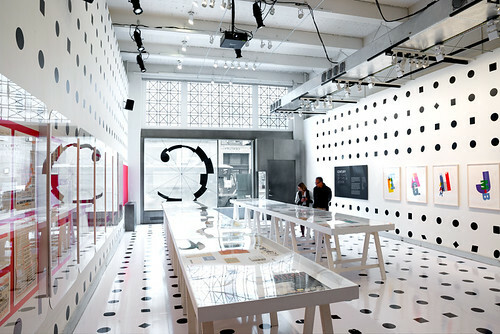 Top: installation view. All photographs: Bilyana Dimitrova. 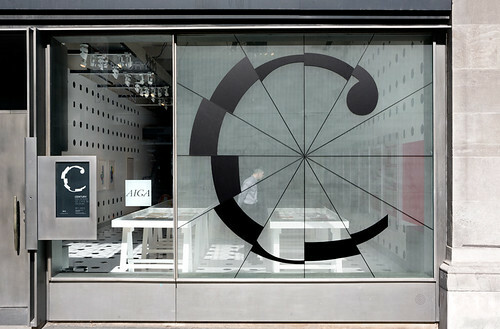 Abbott Miller’s letter ‘C’ identity for the exhibition is configured using segments of Monotype fonts and the ceilings and floors are dotted with full-stops from the foundry’s type library. The identity is complemented by an animation, previewed on Pentagram’s website, that ‘cycles through hundreds of typefaces that move like the minute hand on a clock’. The full stops that line the floor and ceiling are all from the Monotype type library. 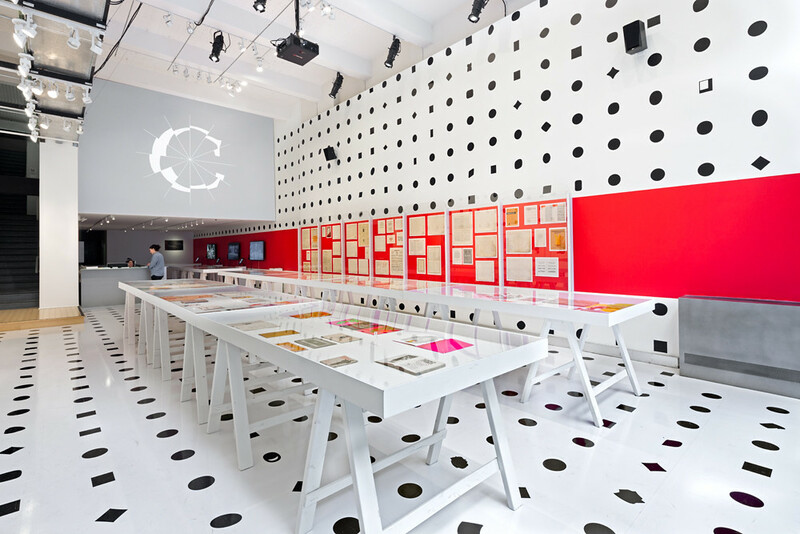 The exhibitors – in addition to Monotype, Pentagram and the AIGA – include Mohawk, the Type Directors Club [TDC], Condé Nast, Hamilton Wood Type, The Type Archive, The Herb Lubalin Study Center, Alan Kitching and The Museum of Printing. All the printed materials illustrate a rich typographic history – ‘from the technological revolution to the digital age’. 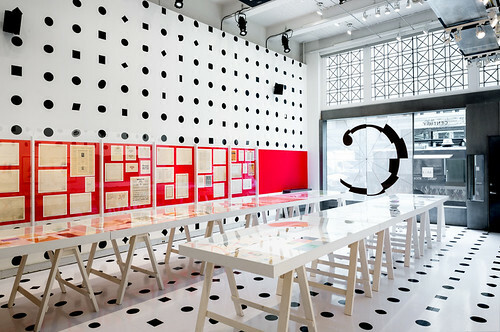 ‘Century: 100 Years of Type in Design’ continues until 18 June 2014 at AIGA National Design Center Gallery, New York. Guided tours of the exhibition take place on Thursdays and free tickets are available on Eventbrite. See Eye 84, the Monotype special issue. All images taken by Bilyana Dimitrova.